Flat #5: This One Bedroom Suite at the Yamhill Flats is spacious in size and residential in feeling. Featuring a modern kitchen, dining nook, living room with electric fireplace, plush couch and chairs for ample seating, these sophisticated suites provide space for relaxation and privacy. 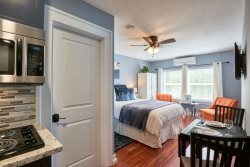 The adjacent bedroom offers a queen bed, ample clothing storage and a second television. The en-suite bathroom features a standing shower, lots of lighting, plush towels and a hair dryer. Beautiful flat close to restaurants and downtown Newberg. Everything was great!... The things that matter most to me are responsiveness and cleanliness. The Lifestyle crew nailed both. 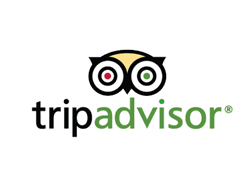 The place was immaculate and they got back to me within a couple seconds everytime we msgd...Excellent Service!! Great place to stay for a getaway to Yamhill-Carlton/Dundee Hills! I thought it would be more our of the way, but this place was right on the main drag in Newberg, walking distance to great restaurants and wineries, and a very short drive to way more. It was the perfect sized studio for 2 with a great little updated kitchen. Professionally managed, so communication was quick and checking in and out was easy and simple. Would recommend highly. We really enjoyed our stay. We felt very comfortable. It was such a nice, CLEAN, comfy, homey place. We really loved it!